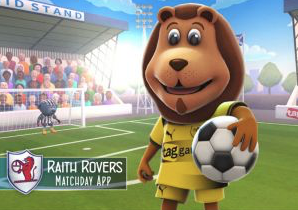 We are thrilled to announce our latest project in collaboration with Raith Rovers FC, Raith Rovers Match Day App. The app, which we believe is the first collaboration of its kind, combines live interactive match day features with gaming entertainment. Fans can practice penalties with Roary the mascot, and on matchday compete with others to top the leaderboard. Fans can also win trophies by checking into the stadium on matchday with their phone’s GPS feature, as well as guessing the crowd size and full time score. The app also allows fans to vote for their man of the match and give their opinions for the next substitution. The Raith Rovers App is available to download free now on iOS. Android versions will be available soon! Newer PostNina is raising money for Special Effect!